Thanksgiving breakfast is the easiest meal to skip; it is often the forgotten meal but the most important of the day. Skipping breakfast on Thanksgiving can increase your chances of overindulging or making poor food choices later in the day. Or even worse, a hurried unplanned breakfast can lead to poor sugary food choices. Our easy fall granola can be prepared prior to Thanksgiving and simply stored in a tightly sealed jar or container. 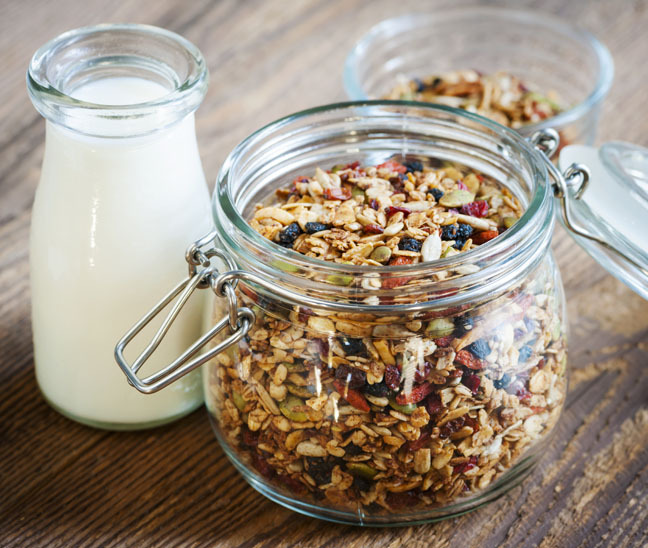 To make your day easier, on Thanksgiving morning set out the granola with honey cinnamon yogurt and fresh juice so family members and overnight guests can make their own breakfast. Are you eating Thanksgiving Dinner as a guest? Take a jar to your host/hostess as a gift; you will be their hero when they wake up on Friday morning. Preheat the oven to 325 degrees. In a large bowl, mix together the oats, coconut, salt, and all the nuts. In a smaller bowl, whisk together the cinnamon, nutmeg, canola oil, and honey. Pour over the oats, coconut, and nut mixture and mix until all is coated. Pour onto a baking sheet lined with heavy-duty foil. Bake for one hour, stirring every 15 minutes, until the mixture is a nice even golden brown. Remove from the oven and stir in the dried fruit; cool completely. Scoop the granola into an air-tight container. Store for up to 3 weeks. Serve with the Honey Cinnamon Yogurt recipe below. Place all the ingredients in a bowl and whisk until combined. 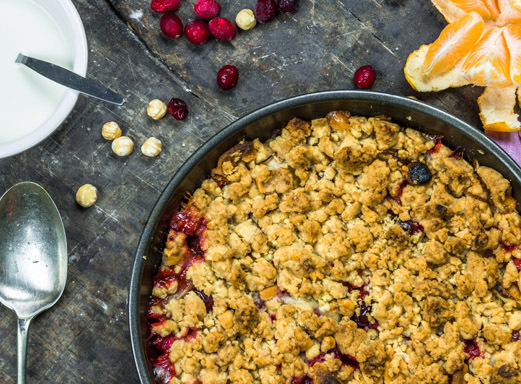 Our Recipe blog for this Week: Apple, cranberry and orange are the perfect flavors for Thanksgiving desserts. Our aromatic recipe is created using homemade or jarred cranberry relish and fresh apples. This recipe is perfect for your Thanksgiving Day dinner or a great dessert to make after the big day with your leftover cranberry relish. Peel and core the apples and cut them into large chunks. Melt the butter in a large skillet over medium-high heat. Add the apples and sauté until they start to soften and their edges brown, about 4 minutes. Add the zests, brown sugar, cinnamon and flour. Stir until well coated. Add the cranberry relish. Stir until combined and pour in a buttered 8″x8″ baking dish. To make the topping: Combine the flour, sugar, salt, zest, walnuts and cold butter in a bowl. Cut in the butter using a pastry cutter or two knives. Cut until large crumbles form. Sprinkle evenly over the fruit, covering the fruit completely. Place the baking dish on a parchment-lined sheet pan and bake for 50 minutes, until the top is brown and the fruit is bubbly.